I’m going on to the next round of So You Think You’re Crafty! Check out the results here. Did you guess which upcycle project was mine? Upcycle…making something old and ugly into something new. I don’t even want to talk about how old and ugly this chair was, but let’s do it anyway. Wonderful SHINY black paint, gold accents, and a funky stencil. We’ve been using it as our computer chair, so it’s been through a lot. From the hole in the cushion that the children enjoy pulling stuffing out of, to the teeth marks??? on the arm, it was WAY past time for a makeover! I couldn’t decide between white or blue, so this chair got both. The spindles and legs got painted white with blue accents. The rest of the chair got painted blue with a white line on the inset part of the seat. I very lightly distressed some of the blue parts down to the white primer just to give it a little rustic feeling. Gotta say, I’m pretty pleased with the outcome! Hope you like it too! Amazing what a little paint can do! Next week’s category is “Kids Can Do.” Stick around to see what I came up with for that. Awwww! So so cute and we love that you used both colors! Looks great!!! Aww, it’s beautiful! I love how you styled it with the books. Lovely!! Thanks, Amy! I was pretty proud of myself! Haha! That is SUPER cute! I love how you did the thin line of white on the seat. What a pretty transformation, such soft calming colours! I love it!! You should be pleased! Its perfect! I love the two-toned look! Gorgeous! I love the shade of blue you picked and how you added a subtle blue ring around the chair legs and the spindles (is that what they’re called under the chair arms????). Great upcycle! Gorgeous! 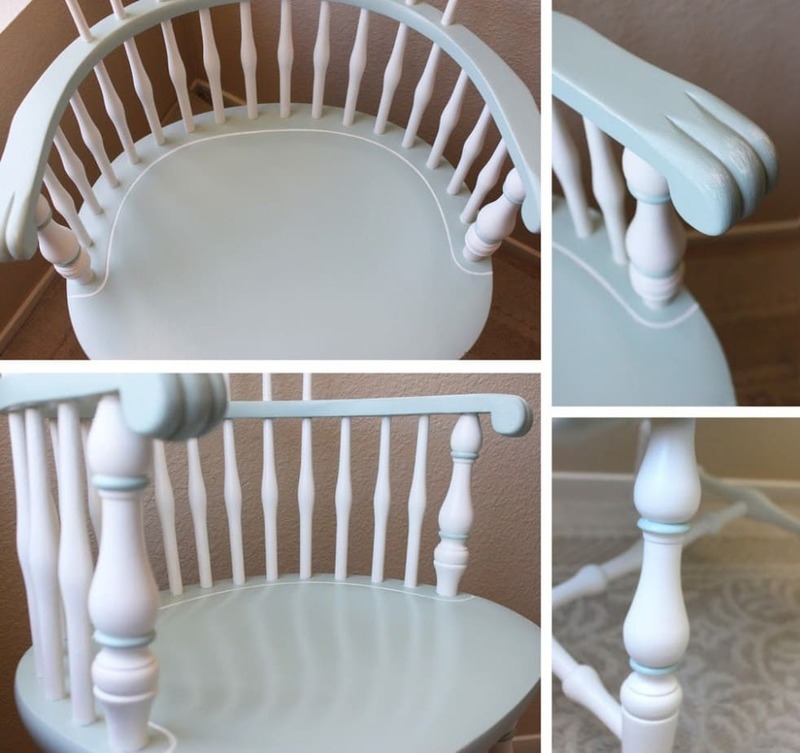 I love the shade of blue you picked and the subtle blue rings you added to the chair legs and spindles (is that what they’re called, the ones that hold up the arms????). Great upcycle! Great upcycle! 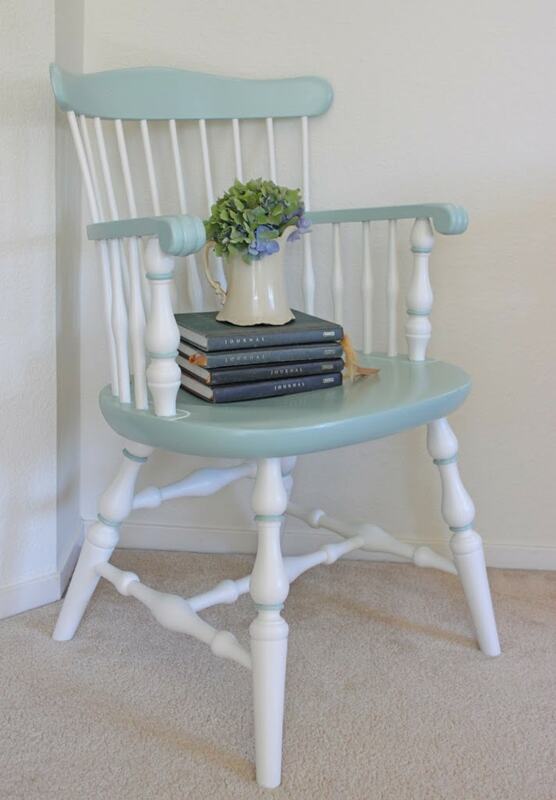 I love re-doing old furniture and recently started using chalk-paint, which I love! The colors your chose are just perfect! Very pretty! That turned out really nice. Would you mind sharing the color blue you used for this? Sure! I used Benjamin Moore’s Wythe Blue. Thank you Jessica. I’m going to get a sample pot of it tomorrow. Have you painted anything else using that color? I also painted these garden signs https://www.cutesycrafts.com/2013/05/garden-signs.html. It looks different in the different lighting. If you google the color, I’m sure you will see more examples. It was Ben Moore’s color of the year recently. Thank you for the links, I appreciate it. Great job – such a transformation! I can’t get enough of Wythe Blue, looks amazing here! This looks amazing! I’ve been trying to think of what color I should redo my dining room set (all spindle legs) now I’m convinced white is definitely cuter than black! 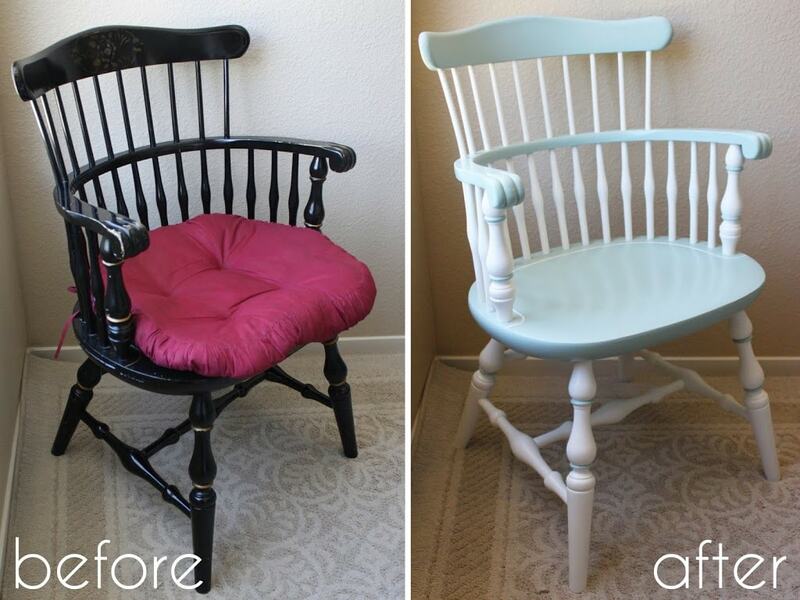 Did you use a chalk paint, or eggshell? I used an enamel paint, but I probably would use chalk paint if I did it again. Just make sure you put a nice, durable finish as the top coat.